Bishop's, Cin Cin, Blue Water, Cioppino's, Lumiere, Bacchus and West are some of the restaurants that come to mind when considering the most expensive places to eat in the GVRD. They all have differing justifications for their pricing and exclusivity. One restaurant I left off the list is Gotham. The flagship of David Aisenstat's restaurant empire (which includes Hy's and The Keg), is indeed one of the most priciest places in town. However, the question always comes up, "is it worth the $$$$?" Hey, I love a good steak and I'm willing to pay for it. Case in point, before the Vancouver Morton's shut down fo r good, I thought the meal was worth the money despite not really living up to the "fine dining" moniker. And that brings up an interesting argument. Is Gotham really a fine dining restaurant? Price-wise and image-wise, it sure seems like it. Ultimately, its true persona is a high end steakhouse serving the only Canada Prime Beef. Tonight, we were going to find out what the fuss is about . Does it stack up to the very best in town or is it a category all by itself? We ended up parking in the Bay parkade and it turns out that it would've been cheaper to do valet (which is a reasonable $7.00). Well, I did want to do valet... but guess who didn't? Anyway, we were greeted and seated expeditiously. The maître d’ honoured our request for a relatively quiet table and seated us upstairs. This way, I could use my flash and bother as few people as possible. There is no way possible to take good photos otherwise since Gotham is quite dark inside. It's actually quite surprising that requests made over Opentable are sometimes overlooked by the restaurant. Our server introduced himself immediately an d proceeded to get our beverages. He explained the menu and the exclusive prime meats they serve. We decided not to have appetizers since our meals were bound to be quite filling. I did not even consider anything else on the menu since I already had the 24oz Porterhouse in my sights. Viv opted for the Petit Filet while mom had the 16oz Prime Rib. 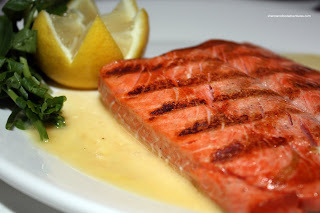 Dad had the Salmon Filet since a huge chunk of meat is a bit high in cholesterol for him. We got 3 sides to share which included Aspargus, Lyonaisse Potatoes and Cauliflower Gratin. We started with their house-made onion loaf which is served hot from the oven. It was pretty good with a nice chewy "oniony" exterior while the bread was soft. 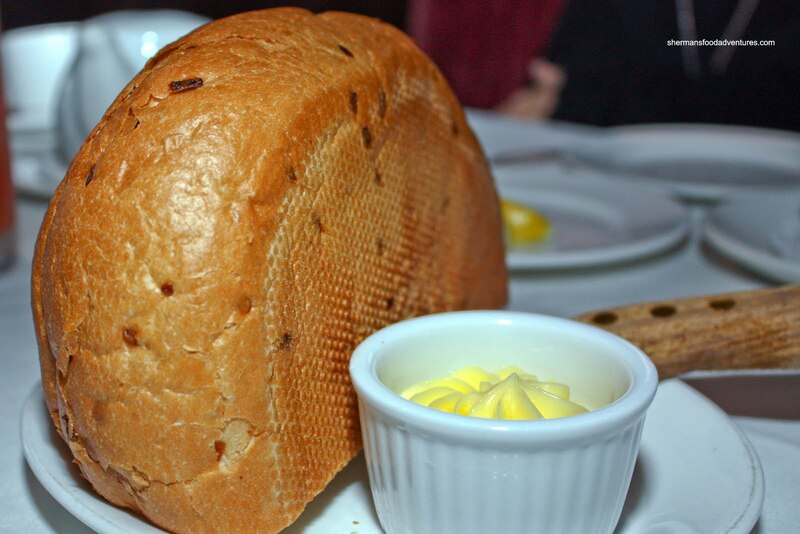 Although it was only a half loaf, we didn't ask for more since we'd only be spoiling our appetite for the meat! Practically taking up the whole plate, my 24oz Porterhouse didn't look as intimidating as it originally sounded. 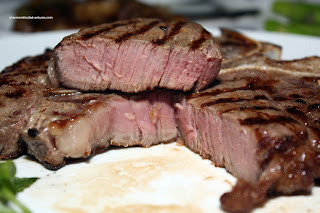 To many, a porterhouse appears to be a good ol' T-Bone steak which is tenderloin on one side and strip loin on the other. However, a porterhouse has a much larger tenderloin portion. I asked for it to be prepared medium-rare and it was pretty much so, except it was c reeping towards medium. Despite this, the meat was extremely moist, especially the tenderloin portion (naturally). It was melt-in your-mouth tender. What I noticed right away was the delicious beef flavour due to the extensive marbling of the meat. I do believe this is one of the best steaks I've ever had. Well, for $52.95, it'd better be! 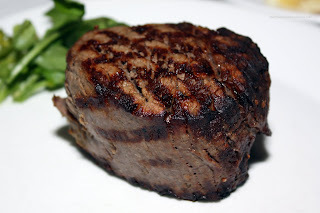 Viv's Petit Filet was cooked a perfectly medium-rare and had nice exterior charring. Again, her steak was buttery soft and flavourful. As expected, the meat rested properly and very little juices wer e wasted. My mom's 16oz Prime Rib was truly a big piece of meat. Double the thickness you'd normally see anywhere else, there were pockets of fat all around the meat. Yum! She also asked for it to be medium rare and for the most part it was. Meaty, well-seasoned and again, flavouful (due to the high fat content), this was a very nice slice of prime rib. It was so big, she could only finish half of it. I tried to help her a bit; but I just ate a 24oz porterhouse! Naturally, the Premium Salmon Filet was a bit of a disappointment. We expected as much. After all, Go tham is a steakhouse. My dad asked for it to be cooked medium and it come out cooked all-the-way through. Don't get me wrong, it was a nice piece of salmon. He still enjoyed eating it; however, he's had much better. 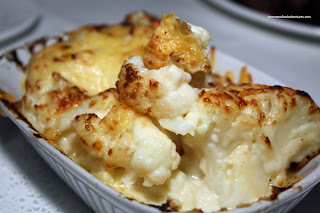 As for the sides, the Cauliflower Gratin was pretty average. The cauliflower itself was perfectly firm while being cooked through; however, we found the sauce a bit bland and not really all that hot. It was still pleasant to eat. It just needed more cheese flavour and a bit of salt. The Potatoes Lyonnaise were pretty good. Each slice of potato was completely cooked while still retaining their shape and integrity. 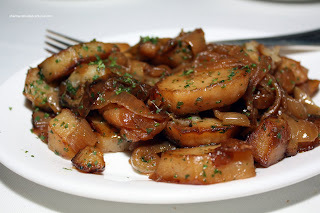 A strong caramelized onion presence upped the ante in terms of flavour and aroma. 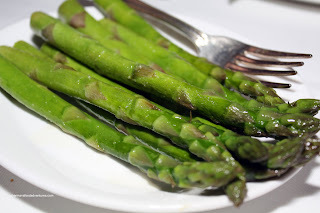 Just barely cooked, maintaining it's colour and texture, the asparagus were well seasoned and buttered. Nothing really more to say about them. We were all quite stuffed and didn't have room for dessert except for Viv. She decided on the Creme Brulee. I gave it a try and personally, I thought it was a bit too sweet due to the relatively thick layer of hard caramel. I'm sure there are people out there who probably like this; but for me, it was just a bit too much. It totally overwhelmed the custard filling, which by the way was quite velvety. So, with our meal over, I began to mull over whether it was worth it or not. Of course, there is the sticker shock of the menu; however, if you examine it more carefully, it's not as overpriced as you might think. Consider the size of the prime rib (16oz) @ $39.95. 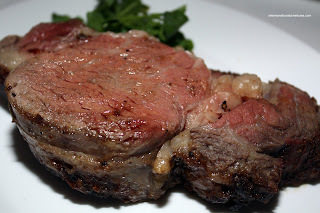 A 10oz prime rib (AAA) at Milestone's is roughly $23.00. So if you take into account the meat at Gotham is superior (Canada Prime) and it's 6oz bigger, it's really not that pricey. The Gotham steak is $2.50/oz, while Milestone's is $2.30/oz. Factor in the different level of service and ambiance, you can see it isn't as outrageous as it may appear. Of course you still have to add the sides, so it's not really a direct comparison; yet you couldn't anyways with the different quality of meat. For me, I'm generally happy visiting the Keg regularly for my steak cravings. However, if you have a brown note burning a hole in your pocket, want to impress someone, won the lottery or just visiting from out-of-town, you can get one heck-of-a-steak here. Ruth's Chris Steak House is by far my best steak experience. We shared a 40 oz porterhouse there, so good. Yup, you're absolutely right. 24oz was not that big, especially with the bone in the middle. Yes, I really need to give Ruth's Chris a go, heard good things! I wonder if I could do a 40oz myself??? warm bread, really? finally, huh? 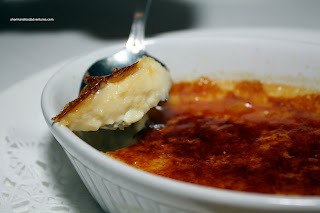 :) i think this place would be lost on me being an aquatarian but i want to go just for the creme brulee. i love a thick layer of crunchy caramel on it! I ate a 20 oz porterhouse once, for less than $15.00 in Las Vegas. I surprised myself because I thought I would never finish it. But it was so tender and delicious that it just disappeared in no time. 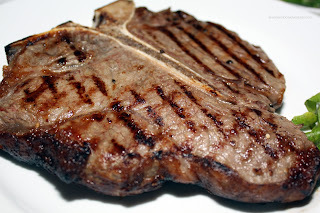 I think everyone needs to taste a porterhouse at least once in their life if they are meat lovers. As to Gotham's? Probably not in this lifetime unless you have another contest? LOL, warm bread... Yah, I never seem to get that. Yes, I thought someone would love the thick crunchy caramel. Just proves that food is a very personal thing. Holly, that's impressive. But you are right, the meat disappeared pretty quickly since it was so tender. Now wouldn't it be amazing if you did win again next year? Sherman, great to read your take on your visit to Gotham. I have been a server at Gotham since day one. Firstly we do not like to necessarilly carachterize ourselves as a formal kind of place. Sure we have a swank room, but we like to think we serve it properly, not formally. We can accomodate all sorts of dining moods. 11 years ago when we opened we served USDA PRIME corn fed beef. Since the "mad cow" period we have been serving CANADA PRIME grain fed beef. When the USDA became available again we chose to stick to the Canadian beef, and I think our guests appreciate it. Yes we are not cheap, but people stopped commenting on the price as they realized that it was worth the price. When we opened it was always an issue. We are blessed with a great room, a great kitchen, supberb beef, and capable service. Glad to hear you enjoyed yourself, and thanks for telling folks about us. Next time try the chocolate bourbon cake. Thanks for the corrections! I have updated it as such. No need to thank me. It is just my honest opinion of the place and frankly, it's not that expensive once you look at what you're getting. I realize this is an older post, but I can't stop reading it! 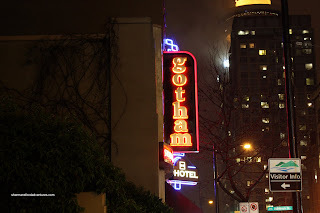 I want to go back to Gotham's, this time with a camera. Your pictures look amazing and you're review is making me hungry. I'm getting chest pains just thinking about it. Thanks for the writeup, looking forward to visitin again! Peter, I totally agree with you. Gotham is expensive, but for me, it is worth it if that is what you want. Great review! The meat DOES look a little on the overcooked side in your photos though. I also prefer my steaks medium-rare, but more on the rare side. Munchkie, I like Gotham despite what others have said. I think people in general get too caught up in pricing and don't look at the final product. The steak is good here, enough said. For the price, you absolutely should have sent that steak back. That's easily medium not medium rare. You should have sent the salmon back too. When they charge that price they have a responsibility to meet certain expectations and with steak the main expectation is that they cook it to the correct "doneness". @Terry I don't disagree with you. But I have a habit with being very forgiving and not sending food back. My bad I suppose.